The last few months have been fairly quiet for us; we’ve spent a lot of time working on the boat. But we’ve also had a few small diversions from being too single-focused. 🙂 It seems appropriate that I get this update posted on Labor Day! Last month we took a trip to Texas to visit Kathy’s family. Her mom Marilyn made arrangements to get two time-share condos in the same complex for the week of July 4th, and all 4 siblings plus spouses and children attended. It’s been more than 5 years since we’ve all been together, and it was great to spend time together! The condos were a bit north of San Antonio, a 4-hour drive from Marilyn’s place. Kathy’s sister Maggie and her husband Frank, live in San Antonio and are planning a dream-home on a lake nearby. On Saturday night the developer of their neighborhood hosted a barbecue & fireworks event, which was a fun way to kick off our time together. We enjoyed a morning walk/swim in the small river behind the condo, watching wildlife foraging at dusk from the back balconies, and catching up with the family. In addition we spent nearly a week with Marilyn in her new apartment, but spent much of our time running errands. We’re moving our “official” residence to Texas, to establish a clear location for tax and legal purposes. We’ve been somewhat inconsistent about our address, between Oregon, Washington and Colorado. We now have a Texas mailing address, drivers licenses and are registered to vote there. Also, we got the boat’s titling updated to reflect Kathy’s name instead of Dan’s father who had co-signed the loan more than a decade ago. And, as usual whenever we visit the States, we came home with some *heavy* suitcases full of stuff for our boat, our kitchen and our closet. The most important project on our list is (of course!) our engine, which we are thrilled to report now seems to be doing just fine. We brought back a new starter motor from Texas and it quite handily starts the engine right up. After installing it, Dan was able to bleed the injectors pretty quickly, and we’ve now run the engine several times for a total of 2 or 3 hours. We’re essentially ready to call the project a success. We do still have a few odds and ends, though. The tachometer stopped working and is of an old design which is primarily purchased these days by vintage car enthusiasts (can you spell “$$$”?). We’re going to replace it with a digital device, since the joys of sailing Lungta do not require “vintage” instrumentation. We’ll probably change the oil one more time just to be cautious, but we’re pleased as punch. 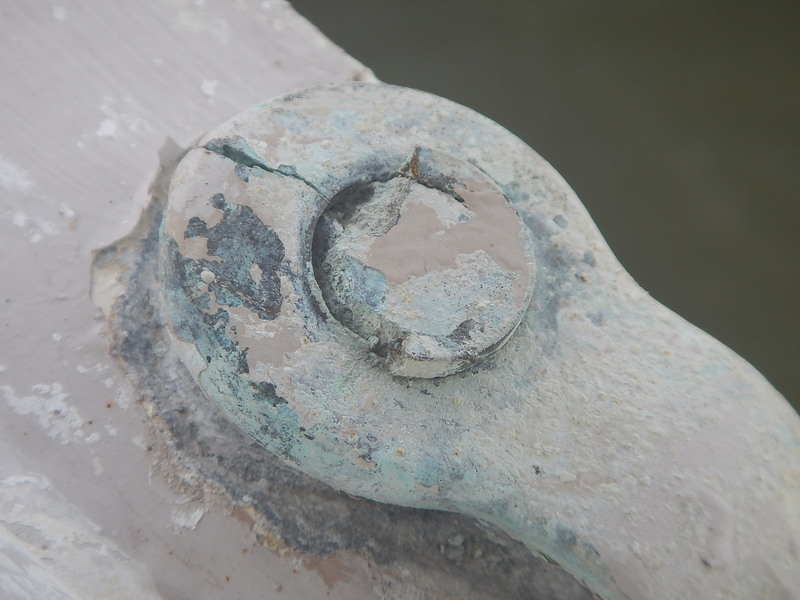 During this time, a project “volunteered” itself; Dan noticed a crack in a turnbuckle that attaches the bobstays (chains) to the bowsprit, forming part of the entire circle of supports that keep our masts where they should be! We rummaged around in our bins of duplicate parts and came up with a replacement. Removing the old one was no small feat, but since it was already damaged we were able to cut it off with a grinder. Then we replaced the chains as well, which had been on our to-do list anyhow. 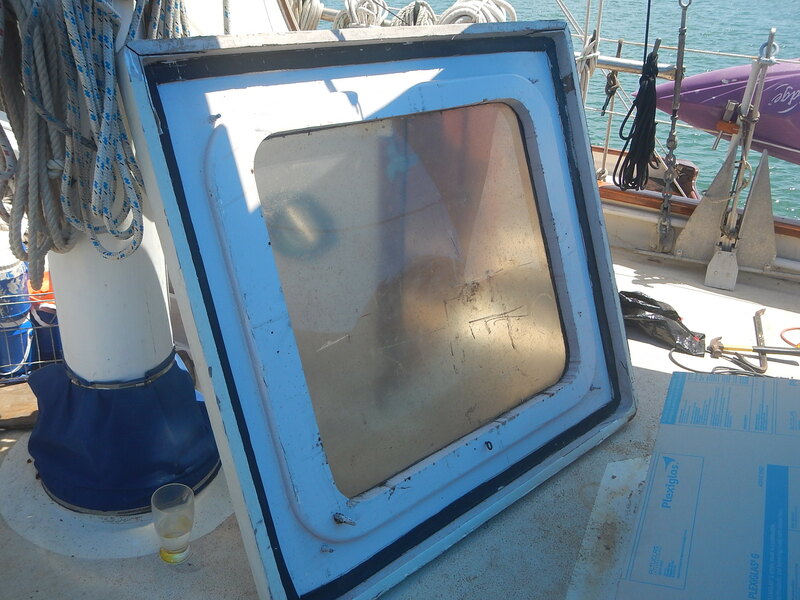 The biggest project we’re working on now is to replace the skylight in the middle room of the boat (the room we call the Office, where the Nest is located, for those who know Lungta). This light is roughly 4′ by 4.5′, so it’s no trivial undertaking to build. We purchased a 4′ x 8′ sheet of Lexan several months ago, had it delivered from Miami by Pablo, a local frieght forwarder, and have been waiting for the right time to begin this project. We had a lineup of projects that required one to be completed before the next could begin, which is not an unusual thing in boats and other small(-ish) spaces. So we now have new chains on 4 of our shrouds (side-load-bearing cables for the mast), PVC conduits on another section of the wiring for our solar panels, and a refurbished hard dinghy (including new lifting eyes, fresh paint inside and a couple of new corners of teak trim)! Eventually though we got to begin the skylight project! We purchased some local wood called “almendra” (almond) to build the exterior frame and wall-extensions; apparently this is not the same tree that produces the almonds that are eaten, but probably a close relative. For the interior flashing of the trunk, we’re using more of the jatoba flooring that we bought before leaving Portland five years ago – when we thought we were going to replace all of the floors. Plans change; what more can I say? 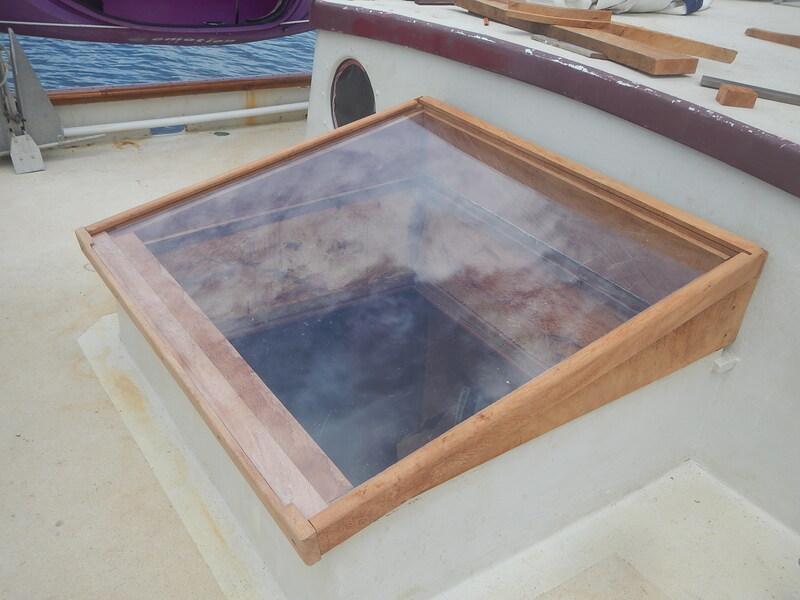 In addition to building the window, we’ll add a couple of new features: a step on either side to make it easier to get on top of the galley trunk without stepping on our new window, and a set of chocks, or cradles, to hold the dinghy secure when we’re underway. 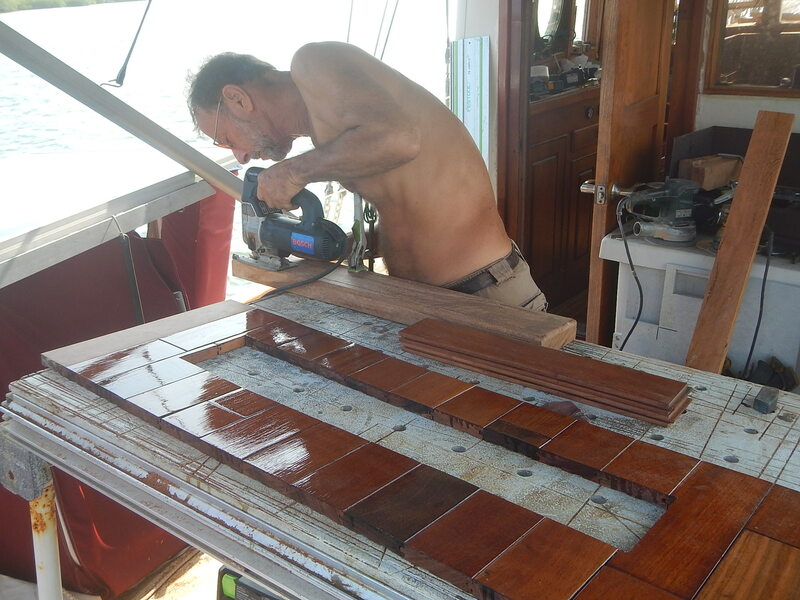 This area of the boat will be more functional as well as more beautiful! Other than the trip to Texas and our slowly shrinking project list, the things going on are fairly short-lived. We have had some nice lightning storms, typically starting from huge clouds that build up in the afternoons over a nearby volcano. We saw nothing of the Perseid meteor shower because of these clouds. 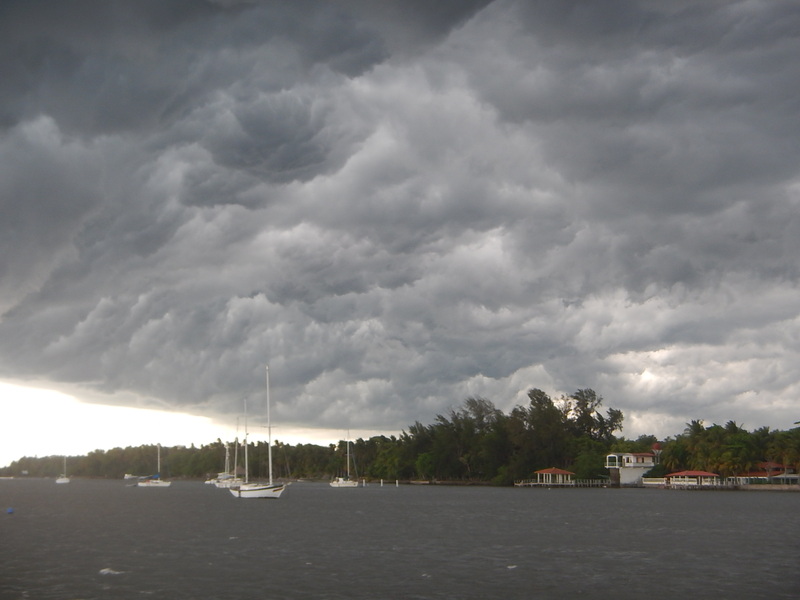 🙂 One day we had a very unusual weather pattern – heavy clouds early in the day, winds from completely the wrong direction – that turned out to be the fringes of a hurricane in the Atlantic that came ashore in Belize. Even though Belize is two countries away, it’s only 200 miles from here! It happened during the national holiday week, and the locals didn’t let the dark weather deter their merry-making. 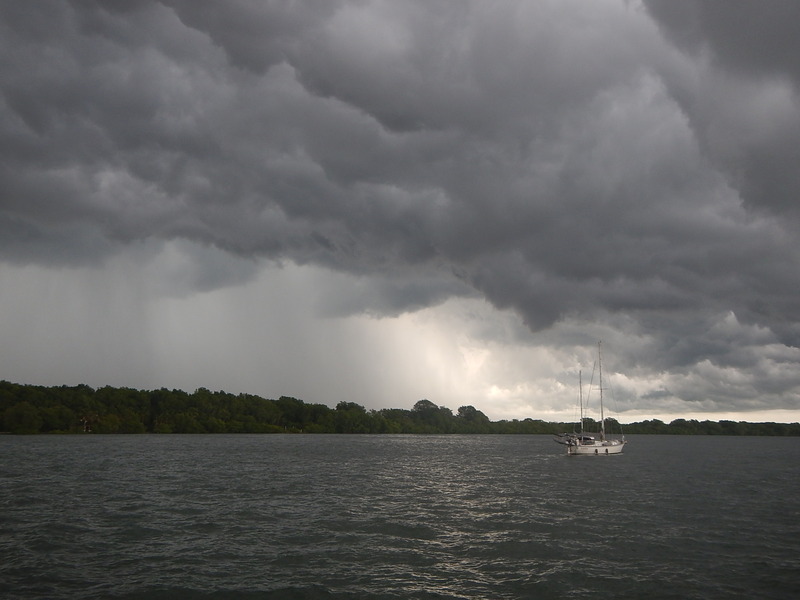 We watched all sorts of water antics as the clouds were building up. Then the navy boat went around and shut things down before the winds got too rough. We’ve developed a rhythm of getting up early to work outside, moving inside during the middle of the day, and heading for the swimming pool at 4 in the afternoon. It’s a nice life!